NELA Extended Memberships are available for any VLA Individual Member. Joint ALA/VLA Student Memberships are available for qualifying students. 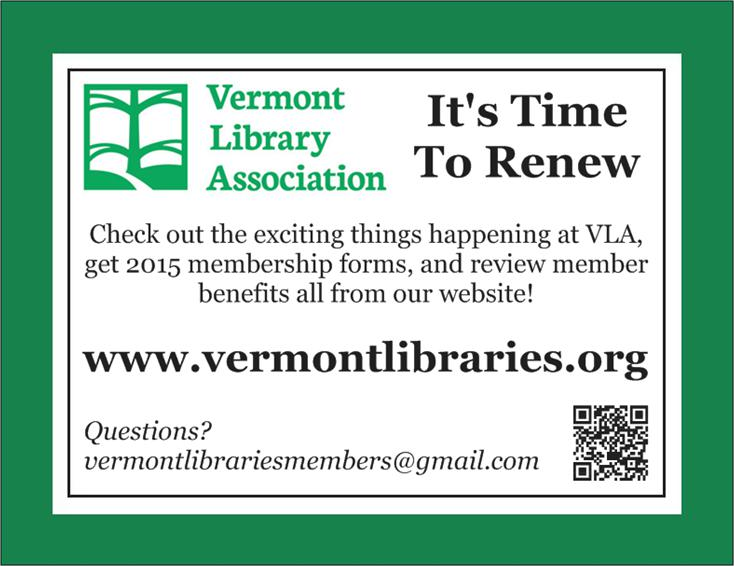 Join or Renew your VLA membership for 2016 today! Keep an eye on your mailbox for the membership renewal postcard. Membership forms are available on this page. Vermont Library Conference Registration is Now OPEN! Registration for the 120th Vermont Library Conference on May 20th at St. Michael’s College is now open! Don’t forget, VLA members get a significant discount on Vermont Library Conference registration, as well as a host of other benefits. If you haven’t already joined or renewed for 2014, you can include a VLA Membership Form with your conference registration and payment for both. Due to unforeseen circumstances, online payment for both the conference and membership will not be available this year. We’ll let you know when it does become available in the future. Additionally, if you register for conference before May 1st you’ll receive early bird pricing. If you have any questions about your membership status, please don’t hesitate to contact [email protected]com. Questions for conference can go to [email protected]. See you at the #VLC2014! The ACLU of Vermont presents An Evening Without: Giving Voice to the Silenced, Thursday, Sept. 26, 7:00 pm, Catamount Arts Cabaret, St. Johnsbury. Vermont writers read from works that have been challenged, censored, or banned. This event is held during Banned Books Week (September 22-28) in celebration of the First Amendment. Admission by donation. Email [email protected] for a flyer to advertise the event. Listed below are FREE programs American Libraries Live, Accessible Technology Coalition, Booklist, Colorado State Library, Effectiveness Institute, Geek the Library, GrantSpace, idealware, Infopeople, Insync Training, Library Journal, Montana State Library, NASA, Nebraska Library Commission, Nonprofit Webinars, San Jose State University, Southern Maryland Regional Library Association, TechSoup, Training Magazine, United States Census Bureau, VolunteerMatch, Washington State Library, and WebJunction will be webcasting during August. Listed below are FREE programs American Management Association, Booklist, Effectiveness Institute, GrantSpace, Infopeople, Library Journal, Lyrasis, Montana State Library, Nebraska Library Commission, Nonprofit Webinars, O’Reilly, School Library Journal, TechSoup, Texas State Library and Archives Commission, United States Census Bureau, VolunteerMatch, Washington State Library, and WebJunction will be webcasting during July. Listed below are FREE programs Accessible Technology Coalition, ALA, American Libraries Live, Booklist, Colorado State Library, Geek the Library, Infopeople, Insync Training, Library Journal, Montana State Library, Nebraska Library Commission, Nonprofit Webinars, O’Reilly, School Library Journal, TechSoup, Texas State Library and Archives Commission, University of North Carolina, VolunteerMatch, and WebJunction will be webcasting during May.